Early last week I took inventory of our roundtable reviews and realized that a fantastic opportunity had arisen. Here we were on the precipice of roundtable 66. We all love Satan even more than beer. It only made sense to review 6 beers for roundtable 66. But six regular beers wouldn't be a very good sacrifice. We needed six evil-inspired brews. We also needed to dress the part. So we put our heads together and came up with evil inspired clothing and an even more evil beer list. Because we were drinking evil beer, I thought it might make sense to not only give them mug rating, but also compare them to people or things; "Is this beer evil like Hitler, or evil like the Teletubbies?" As you'll see below, true evil isn't as commonplace as these brewers might have you believe. Naming your beer Satan is a bold move. It's hard to get more evil than Satan. Or so we thought. This beer fell quite short of the supreme evil of Satan and instead landed somewhere around Willard Scott. The nose was full of lemongrass, lemon, grapefruit and a musty, gassy odor. The flavor was surprisingly watery with a decent alcohol feeling at the swallow. It had Belgian notes such as coriander, honey, cantaloupe, lemon, and a bit of candi sugar, but none of the flavors melded well enough to work well together. Overall, this beer just fell short of everything the name promised and instead left us feeling like a broken fast food clown wanting to wish someone a Happy Birthday. Creepy? Sure. But certainly not Satan. For my review, I decided to write in the voice of Andy Rooney, who we all decided was the best evil match for this beer. Andy Rooney: You know what really burns my bread? 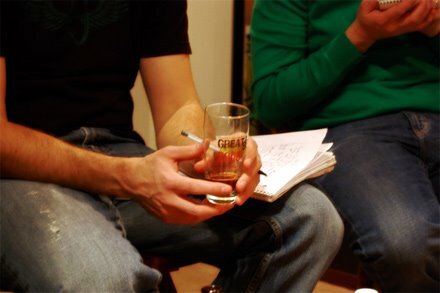 Those darn Hoosier Beer Geeks and their crazy review styles. Evil beers as famous people? Back in my day, we'd pull the tab on a Budweiser and call it a day. 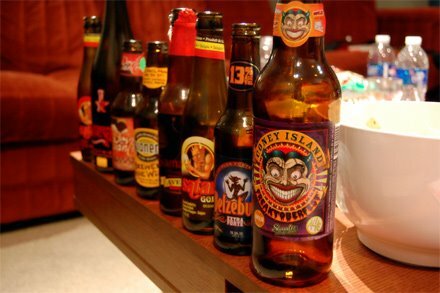 These days kids are drinking beer with names like Freaktoberfest, saying it has a nose like Hawaiian Punch and a taste that's lagery with a bit of fruitiness. Is lagery even a word? Bitter and unsettling they said about that one, too, a bit like me, I suppose. Maybe these Geeks are on to something. "Just look at it with its beautiful body and a fingers worth of tan head on it. It is just so inviting with his pleasant smell of espresso, coffee grounds, oatmeal, and a bit of smoked peaty goodness. It that wasn't enough the flavor delivers on the promise of the nose with tastes of coffee beans, espresso, toasted malt, and then even a touch of chocolate and caramel to finish off the flavor profile. This leaves a bad taste in my mouth friends, it is just too much boldness and flavor for the Joe the Sixpack Plumber types. The mouthfeel on this beer also doesn't let you forget about it either. It is always there with a silky smoothness and perfect carbonation just letting you know it is better than most others. I can't say enough things about how amazing I am, and how amazing this wasn't. If you are into coffee flavored beer, great mouthfeel, and beautiful nose that provides a change from the ordinary and create a wonderful drinking experience this might be up your alley, but I think my base is much stronger than that." Ok readers, that was a lame attempt at humor. But we somehow picked Barack Obama for this beer for some reason, and this was the only way I could personify any evil for this beer. I guess something this good must be deliciously evil. It was an amazing drinking experience and one of the best coffee beers I've personally ever had the pleasure of drinking. Tyranena is only available in Wisconsin, but if well worth your time if you can get your hands on any. And if you do, would you buy me some? Alesmith is one of those breweries whose products somehow never make it to Indiana, despite the fact that it somehow gets to Columbus, Ohio. If anyone can figure that out, let me know. In any case, absence makes the heart grow fonder, and in the case of Alesmith it's often deserving of that fondness. Horny Devil is a fine example - a cloudy golden ale with hints of orange, alcohol, cheap men's cologne (so says Jess) in the nose. Big big flavors come out on first taste - grape, orange, and sour apple all come to the party. The beer has a boozy kick, and a nice mouthfeel that coats the mouth and tongue. Though the beer is 11%, we would have been happy to drink as much as we could. We decided the evil person who best compares to this beer was none other than Chris Hansen - because the beer tempts you with sweetness before throwing you down face-first in the driveway of a stranger's house. Samael: The Angel of Death in Jewish lore. According to The Sayings of Rabbi Eliezer, it was Samael, not Satan, who tempted Eve, seducing her and then impregnating her with Cain. Not a real warm and fuzzy type of angel, eh? So one might expect a beer named after Samael to be severe. Dark. Intense. 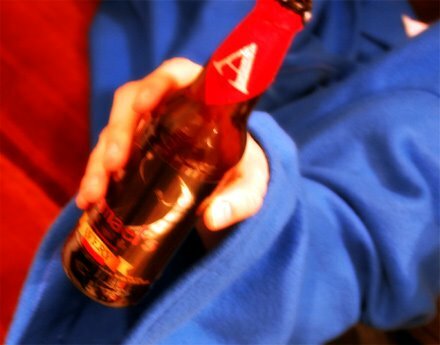 But Avery Brewing Samael's Ale, while intense, certainly wasn't dark or severe. This oak-aged English Strong Ale, which was our penultimate beer, clocked in at a hefty 14.5% ABV. It poured with a brownish-orange hue and had a nose heavy with oak, caramel, and brown sugar. The flavor was a pleasing fountain of oak, apple, and bourbon notes. And no, the beer wasn't severe and dark. Rather, Samael's Ale was warm and sweet. Indeed, this beer could best be considered cuddly, much like you'd expect a cherub to be and not what you'd expect an Angel of Death to be. 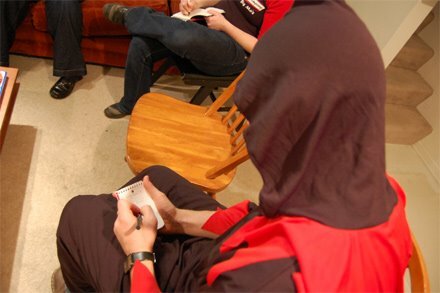 So, when we struggled to find an evil analog for Samael's Ale, only one thing came to mind: the ubiquitous Snuggie, that most evil of cuddly things, evil because no matter where you turn, no matter what you do, the Snuggie is there, following you, refusing to let you be, yearning to envelop you in its coziness. 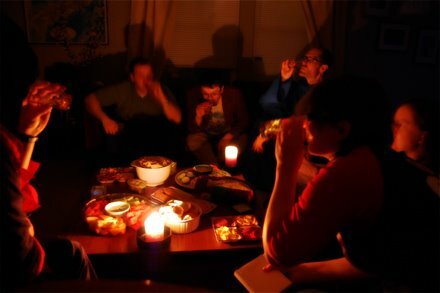 And envelop me in coziness Samael's Ale did. Alright, I'll warn you in advance that the celebrity evil to beer evil corollary quotient on this one is pretty low. The Avery Samael 2006, another year older and a little less enjoyable. This one tasted more like a barley wine than the 2007 and the sweetness was less candy-like. It also lacked some of the dynamic flavor profile of its younger self not unlike the transition from Smokey and the Bandit to Smokey and the Bandit 2. The nose was much more subdued, you might even call it a button nose. It's a beer that can be appreciated in a small quantity, not unlike the small actress who just sort of popped into my head when I was drinking this, and isn't evil in the slightest (as far as I know). In case you haven't guessed it already, the winner is Sally Field! 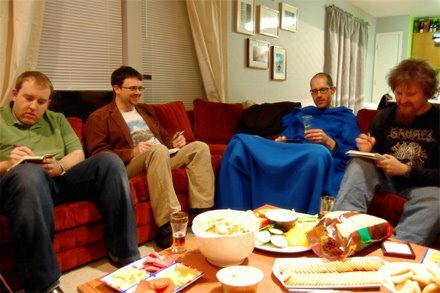 A snuggie, Chris in an evil smock, candlelight beer drinking, a giant Satanic header image, no comments. Matt R. I liked the Obama / McCain reference. Don't sell yourself too short. I think we scared everyone off with this review. oops. Must have been my outfit.